Jean-Jacques Waltz (23 February 1873, Colmar - 10 June 1951), also known as "Oncle Hansi", or simply "Hansi" ("little John") was a French artist of Alsatian origin. He was a staunch pro-French activist, and is famous for his quaint drawings, some of which contain harsh critiques of the Germans of the time. He was also a French hero of both the First and the Second World Wars. Jean-Jacques Waltz was born in Colmar the 23 February 1873, two years after the annexation of Alsace by the German Empire following the Franco-Prussian War of 1870-1. In German-occupied Alsace, he worked as an artist for the textile industry, and drew postcards and programmes for local events. He started publishing satirical works in 1908 under the pseudonym "Hansi", making particular fun of German tourists. Hansi became famous with his polemical satiric work Professor Knatschke (1912), which became a best-seller in France, as well as several other militant works. He came to incarnate the symbol of pro-French Alsatians, especially among "revanchist" French intellectuals such as Maurice Barrès. 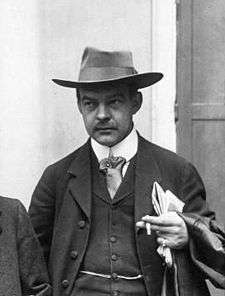 Hansi was imprisoned several times by the German authorities for making fun of the German military and professors, culminating in a one-year sentence given by the tribunal of Leipzig in July 1914. This caused a national outrage in France, making headlines in newspapers and inspiring two editorials by Clemenceau. Hansi eventually escaped to France, where he joined the military as a translator-officer when the First World War broke out. In 1940, Hansi, still wanted by the Gestapo for his militant works and his treason of 1914, had to flee into Vichy France. He was attacked by the Nazis in Agen, and fled to Switzerland. Badly wounded because of this attack, he remained weak until he died in 1951. Hansi is now archetypal of Alsace folklore. His original books, published in a few thousand copies, are valued among collectors. It is very common to find plates and every-day items decorated with his drawings. His books have been republished several times. (French) L'histoire d'Alsace recontée aux petits enfants par l'Oncle Hansi (History of Alsace told to children by Uncle Hansi), one of Hansi's major works available online.